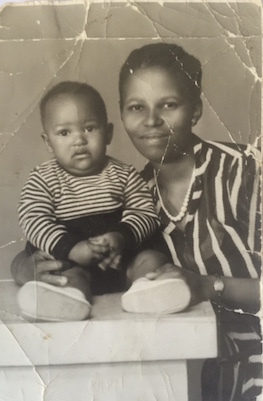 I was born on Sunday July 4, 1948 in Johannesburg at Coronation Hospital. My mother, Regina Makhosazana Ndebele, uMaTshabangu, was a nurse there. 923 John Mohohlo Street, Western Native Township, my home where I became a part of my family, was not that far from Coronation Hospital. It could have been as long as it took us to walk to Christ the King Anglican Church in Sophiatown. A busy main road and a tramline that ran parallel separated us from our more famous township neighbour. When my father was promoted Principal of Charterston High School in Nigel on the East Rand, we moved there, just ahead of the mass removals of people from Western Native Township and Sophiatown to Soweto. At Emzimkhulu Lower Primary School in Charterston where I began to go to school, the majority of teachers related to pupils the way my father did to Archbishop Tutu and his classmates. I remember Mistress Yende in Standard Three, and teacher Maseko in Standard Five at Zakheni Higher Primary School. I loved them. A few seemed resourceful in inventing new ways of inflicting pain on us children. We talked about these a lot. In 1960 I went to boarding school in Swaziland at St Christopher’s Anglican School for boys. It is there that I matriculated in 1966. There were many of us boys from South Africa. Our parents to us there escape save us from Bantu Education, the segregationist education designed to train black South Africans for menial labour. Hendrik Verwoerd, when he was the Minister of Native Affairs and was also known as the “Architect of Apartheid” notoriously stated: “There is no place for [the Bantu] in the European community above the level of certain forms of labour … What is the use of teaching the Bantu child mathematics when it cannot use it in practice?” That was in the early 1950s, not long after the apartheid government came into power in the year I was born. At St. Christopher’s School, Teacher Radebe proved Verwoerd wrong. An outstanding teacher of mathematics, he instilled a lifelong love of mathematics in many of us. So did Teacher Humphrey Langa who taught us Physics-with-Chemistry. Such teachers got us to rise above the state of life planned for us by Verwoerd. This best time of my life began when I enrolled as a student at the University of Botswana, Lesotho, and Swaziland, at the Roma campus in August of 1969. By the time I graduated first class in English and Philosophy in 1973, I had already published poetry in literary magazines such as the The Classic, Contrast and the Purple Renoster. I had also been editor of the student magazine Expression. This was an exhilarating start for a young writer. Academic life at Roma was indeed exhilarating. We were students from Botswana, Lesotho, Swaziland, South Africa, Zimbabwe (then Southern Rhodesia), Mozambique, Kenya, Uganda, and The Gambia. Our lecturers and professors came from the UK, USA, The Netherlands, Canada, France, South Africa, Lesotho, Rhodesia. No other academic institution of higher education in Southern Africa boasted such an internationalist and cosmopolitan academic and intellectual environment. We enjoyed total academic freedom. No global issue escaped our attention. We studied and debated among others matters, the decolonisation of Africa and the “Third World” with a handful of countries left, particularly in Southern Africa. History, philosophy, economics, literature were some of the vehicles through which we engaged with these issues: the Cold War between the USA and the USSR; the ousting of invaders USA and China by the Vietnamese; the resilience of Cuba against the USA; and the great anxiety over the Nkomati Accord, which led to a strand of opinion that apartheid’s P W Botha had managed to contain liberated Mozambique’s Samora Machel. I’ve always thought that this Accord was a result of a joint recognition of the importance of realism at a particular moment in the flows of Southern African history. I believe that the spirit of this accord was to be mirrored in the South African negotiated settlement that led to the historic elections of 1994. Such topical issues shaped our political land moral perspectives at UBLS. Being on such a campus, completely surrounded by South Africa was in itself a profound act of resistance against global imperialism generally and racist oppression in South Africa, specifically. In the winter of 1973 South African security agents visited my home in Charterston Location, inquiring after me. I resolved not to return home. Having arrived in Lesotho alone in 1969, I returned home in 1990, the year of Madiba’s release, with a wife and three children. Twenty-one years old in 1969, and 42 years old in 1990, I was half-and-half formed by two countries. With Lesotho as my second country, I had traveled to many other countries. They too became a part of me. Cambridge (UK) for my MA; Denver (USA) for my PhD. There were several other countries in Europe and Africa, where I attended writers’ and other conferences. 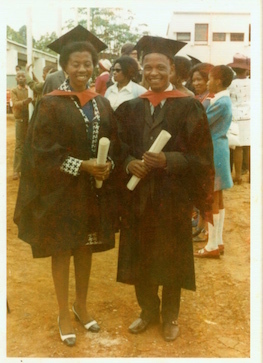 By the time I left Lesotho for South Africa, I had become Head of the Department of English, Dean of the Faculty of Humanities, and Pro Vice-Chancellor at UBLS, which in 1975 became the National University of Lesotho. I was trained and experienced enough to participate at the highest levels in the recovery of South Africa by its oppressed black citizens. Beginning at the University of the Witwatersrand, I wore the shoes of esteemed Es’kia Mphahlele as the Chair and Head of Department of African Literature. Then Vice-Chancellor Jakes Gerwel recruited me to join his executive teach as a Deputy Vice-Chancellor at the University of the Western Cape. A year and a half later I was appointed Vice-Chancellor of the University of the North. It was a time of great mobility for a wide spectrum of professional people politically and legally previously excluded from participating in the organised social order in South Africa. After a full term of office at the University of the North I spent just under two years as Scholar-in-Residence at the Ford Foundation in New York. It was the second glorious time in my life. My wife and I fell in love with New York City, and the affection remains to this day. 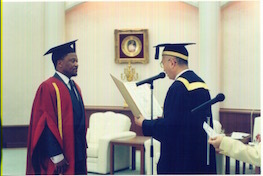 In 2000 I began what would be a two-year term of service as Vice-Chancellor and Principal of University of Cape Town. It was to be a most fulfilling time in my executive career. At the end of it, I had experienced the entire range of higher education institutional types. I had also been exposed to a wide geographical experience of my country, having lived at the centre of South Africa in Johannesburg where I was born; in the Western Cape; in the north; and back at the Western Cape where I still am now. Grandchildren are a new marker in the passage of time. Periodically, I ply between Cape Town and Johannesburg to officiate in Graduations at the University of Johannesburg where I am Chancellor. Each time I am there, I feel the campus’s close proximity to where I was born. More than a connection of office and function, there is a bond of emotion between UJ and I. The Black Consciousness Movement (BCM) which flourished in the 1970s gave my political instincts strong psychological moorings. I experienced it as an authentic existential base from which to imagine a future democracy in South Africa in which the “black experience” was taken for granted as the normative base of a national identity, and which did not need to justify itself in an endless protest mode. I first entered the BCM when, as president of the Students Representative Council at the UBLS, I was invited by the South African Students Movement (SASO) to deliver a keynote address at their historic Second Annual General Students Council, at Hammanskraal in 1972. The letter of invitation was signed by the General Secretary of SASO, Barney Nyamko Pityana. My address was an analytical reflection on social groups among black South Africa and and the relative location of each in the struggle for emancipation. 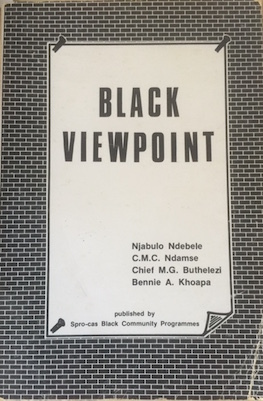 It was published in the first edition of Black Viewpoint in 1972 edited by Steve Biko. The culmination of the period for me was when BCM activists Jeff Baqwa and Ongopotse Tiro came to Lesotho in the winter of 1973 to begin to implement a BCM plan to spread the students’ movement across Africa, beginning in Southern Africa. The Southern African Students Movement (SASM) was launched at the Roma campus of UBLS with inaugural members from Lesotho, Swaziland, Botswana, Namibia, Zimbabwe, and Mozambique. I was elected onto the Executive Committee chaired by Tiro as President and, to take advantage of my impending travel to Cambridge on a Churchill College scholarship, was made the international organiser. Little did we know that the organisation that partly supported SASM, the International University Exchange Fund (IUEF) would be infiltrated by South African spy Craig Williamson, to devastating effect. Tiro received a parcel with postal markings he trusted were from the IUEF. His trust was his tragic death. At the time he died we were preparing for SASM’s first Annual General Meeting in the winter of 1974. I nevertheless travelled to Botswana to see what could be rescued. No human being could have survived the power of the destruction that wrecked the house in which Tiro opened the parcel of death. The exporting of the spirit of the South African students’ movement beyond the borders of South Africa must have been deemed a strategic threat by the apartheid government. The brutal end of SASM was an outcome of that assessment. The reflections in my SASO keynote address were consistent with the impact on me of the literature curriculum of the Department of English at UBLS at that time. My extensive reflections on this experience were to be articulated many years later in my keynote address at the 40th Annual Conference of the African Literature Association in 2015 held at the University of the Witwatersrand. “It is significant that in a country peopled to the extent of 75% by blacks and whose entire economic structure is supported and maintained, willingly or unwillingly, mainly by blacks, we find very few publications that are directed at, manned by and produced by black people. The kind of communication Biko envisaged ought to be normal in South Africa today. But it isn’t. Black South African’s still feel impelled to make a case for their lives against the resilience of their structural exclusion from an economy that millions of workers and their children continue to experience as predatory and exclusionary. Against such a background, the stories in Fools deliberately explored a world with no white people in it. By the time these stories were written and published, my understanding of Steve Biko’s perspective had been considerably deepened by the sharpening of my intellectual and creative sensibilities in Cambridge and later in Denver. There I was exposed to some of the great stylists, and innovators in fiction across many traditions of fiction beyond my African influences. They included James Joyce, Gustav Flaubert, Virginia Wolf, Henry James, Fyodor Dostoevsky, William Faulkner, Arthur Koestler, James Baldwin, Toni Morison, Leo Tolstoy, Nikolai Gogol, Ernest Gaines, Thomas Mann, Franz Kafka, Gloria Naylor, John Edgar Wideman, James Alan McPherson, Yukio Mishima, Paule Marshall, Edwidge Dandicat, George Lamming, Kobo Abe, J.M and others. These writers built on a firm base of African influences primarily of my UBLS days: Thomas Mofolo, Sibusiso Nyembezi, Chinua Achebe, Wole Soyinka, Camara Laye, Ferdinand Oyono, Cyprian Ekwensi, Ayi Kwei Armah, Mariam Ba, Eskia Mphahlele, Lewis Nkosi, Mongo Beti, Alan Paton, Bloke Modisane, A.C. Jordan, Mongane Serote, Nadine Gordimer, Sipho Sepamla, Mbulelo Mzamane, Noni Jabavu, Sol Plaatje, Mirriam Tladi, Ngugi wa Thiong’o, Can Themba, Nuruddin Farah, Kole Omotoso, Kwame Nkrumah, David Mailu, Ama Ata Aidoo, J.M Coetzee and Andre Brink, are but a sample. 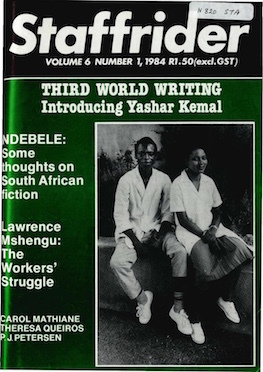 Staffrider Magazine was a landmark popular publication in South African literature. It had been going since the historic year 1976. That was when the school children of Soweto confronted the might of the South African Defence Force deployed against them by the South African government. By this action, the white government definitively saw black people in South African as an external enemy to be destroyed by its army. Thousands of young lives were lost in an uneven battle. Perhaps as great a tragedy was how the apartheid government deployed its own young in the army to kill their black age mates who lived in the townships. 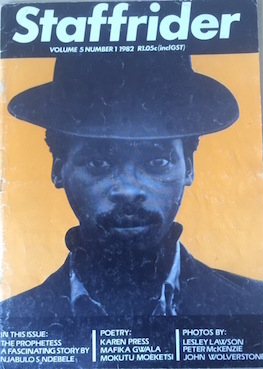 The play Back Dog/Inj’emnyama created and workshopped by Barney Simon and his cast in 1984, explores the stirring interaction of young characters involved in and affected by the student resistance of 1976 from their various racial, social, and cultural backgrounds. In the time of the #RhodesMustFall Movement the play still rings with timely relevance. But in the same way apartheid guns did not stop young people, they did not stop the emergent flowering of creative activity in literature, theatre and music from South Africa’s townships. Within a year of my return to Lesotho with a PhD from Denver, Mike Kirkwood, Staffrider’s intrepid editor, sent me a copy of Anatolian Tales, a book of short stories by Turkish writer Yasar Kemal. At the time, there was a running discussion in South Africa about storytelling and fiction writing as narrative modes. Kirkwood wondered what I thought of Kemal’s tales against the running public discussion. The result was my article, Turkish Tales and Some Thoughts on South African Fiction in Staffrider in 1984. It became an influential article in the discussion of the relationship between literature and society in South Africa. 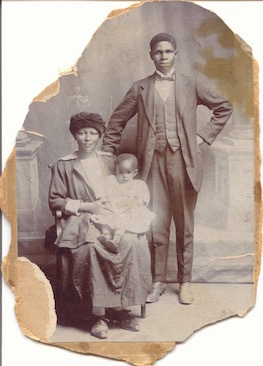 The antecedents of Turkish Tales can be traced to Lewis Nkosi’s essay “Fiction by Black South Africans”. I have never forgotten the mind opening impact of this essay when I first read it at what would later be named the Thomas Mofolo University Library at UBLS. At first, resisting the power of its message out of an instinctive solidarity with the literature under review, I had eventually to give in the power of Nkosi’s reasoning. Nkosi’s essay pushed me to recognise and embrace the powerful value of open mindedness. He put a marker on the reading of South African literature. If ‘Fools’ and Other Stories expresses my fictional explorations, the collection of essays known by the title Rediscovery of the Ordinary: Essays on South African Literature and Culture reflects my attempts to unravel the theoretical underpinnings of my own creative writing, at the point at which I had become my own reader. How much of the social is in the art, and the art in the social? How much of the human is in the art, and the art in the human? 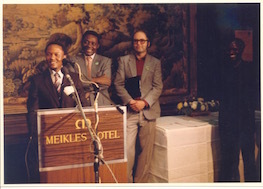 In July of 1987 I was elected the first President of the Congress of South African Writers, a position I held, upon reelection, for ten years. The organisation, partly formed in response to the notion that culture and art be regarded as a weapon of struggle against apartheid, brought together experienced and new writers across all genres. As more experienced, older writes shared their experience, they were in turn energised by the perspectives of younger, relatively inexperienced writers. It made for a dynamic mix of energies. To be a part of this from Lesotho, whose passport enabled me to slip in back home, kept me connected to the energy of resistance in South Africa. I was Vice-Chancellor of the University of the North when freedom came in 1994. I remember the sudden, almost euphoric lull that descended on an otherwise rumbustious campus. Adam Kahane, writer and facilitator of dialogues on “tough problems”, facilitated a historic campus dialogue over three days. The dialogue brought together a cross section of teachers, students, and workers to envision together the future of the campus. It was an extraordinary, tightrope walking experience that seemed to work for a while. It was an attempt at public transparency, trust and visioning as foundations for sustainable solidarity on an otherwise fractious campus. There were to be no protest songs on campus for while, but plenty of tough interactions. Three years later around 1997, a year before the end of my tenure, things seemed to come apart. The reasons are many and still require inquiry and understanding. But it did look to me that although the old was dying, the new seemed uncertain about what it knew of itself, not sure how to sustain the new sense of possibility before it. There was the sense of a campus preying on itself. The means of combating the old, appeared to be turned on the new with similar intensity. In 2016 South Africa and its new institutions are still struggling with the gap between the vision of the future and how best to get to it. I published two books during my tenure as Vice-Chancellor of UCT: The Cry of Winnie Mandela (2004) and Fine Lines from the Box: Further Thoughts About our Country (2007). I like to think that they came out of the compulsions and resilience of the artist and thinker in me to stay alive. I retired from the daily routine of work in 2008. 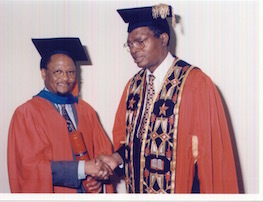 I had been involved in the executive leadership of South African and African higher education for two decades. 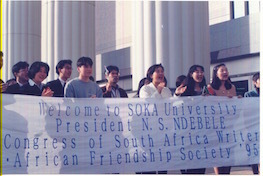 In that time I was privileged to serve in the elected positions of Chairman of the South African Vice-Chancellor’s Association (SAUVCA) and also later when it became Higher Education South Africa (HESA), and finally as President of the Association of African Universities, with its headquarters in Accra, Ghana. Two of Nelson Mandela’s legacy organisations on which I serve respectively as chairman, keep my finger on the pulse of a vibrant country still on the path to its future: the Nelson Mandela Foundation and the Mandela Rhodes Foundation. Other organisations are the Allan Gray Orbis Foundation, MTN Foundation, Deloitte Africa, the Cape Town Partnership, the UBLS Association, and the Archival Platform. My fellowship at the Stellenbosch Institute for Advanced Study and at the Archive and Public Culture Research Project at UCT, keep me engaged with the academic endeavour. I have become profoundly aware of the importance of strong institutions in any successful society. Institutions wherever they are, represent a solemn agreement among those that have created them to surrender a little of themselves to the common good they have identified, defined, and committed to. Such institutions mediate the space where our personal inclinations often seek to overcome our solemn rationality. They enable us to face mandatory limits embodied in the supremacy of our agreements. Because such agreements are never infallible, they can be changed in the face of the most rigorous of reasons why they should be changed. Nearing completion is a book with the working title “Beyond Sweaty Windows”. In it I reflect on the extraordinary boxing achievements of the Eastern Cape. Over a thirty-year period Mdantsane has done what I believe could be unmatched in the world. It produced more than twenty world champions and fifty national champions all within the radius of town and township. It is a remarkable demonstration of self-organising effort within a small geographical setting. Why were they able to do so? Perhaps there is a policy blind spot in South Africa’s still new democracy. Are we not focussing too much on an inherited mainstream economy that is still structurally, fundamentally predatory on a population captured over one hundred years ago. Isn’t that the economic solution for the millions of unemployed or underpaid employed cannot entirely be within that economy. It may be vital in the short to medium term to keep aspects of it alive, but how prevalent are the examples of Mdantsane in the national landscape as the foundations of a new economy? Cape 300 Foundation Molteno Gold Medal for services to literature and education, 2015. 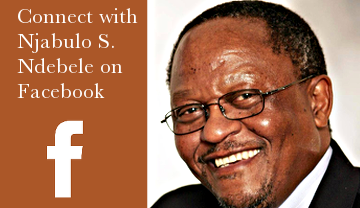 Click the items below to hear Njabulo S. Ndebele speak about writing and the academy, and view a slideshow of selected photos from his life.